Nearly 70 restaurants and food trucks will converge on Grant Park for the world’s largest food festival. Since 1980, food, music & cultural activities have made this one of the most looked-forward to events of the summer! This 5-day festival is fun for the whole family. Restaurants, pop-ups, food trucks- oh my! Lining both sides of Columbus Drive is a dazzling array of food options. The list of five-day restaurants is impressive and continues to grow. Out of the 35 restaurants, there are 6 newcomers that locals and visitors alike are excited to welcome. Pop-up vendors will also be out in full force with 16 diverse dining options that will satisfy every palate. Rolling in to satisfy your sweet tooth, burger addiction, or any other craving you might have is a fleet of 16 food trucks. Definitely come hungry to this event! You’ll want to try as much as you can. Get ready to dance! The Petrillo Music Shell is home to world-class performances every day of The Taste. Featuring artists like Alessia Cara, Passion Pit, and The O’Jays. The best part? Lawn seating in Butler Field is free! Seats closer to the stage will set you back around $20 and you can purchase them here! View the whole lineup here to plan out your perfect weekend. Want even more music? The Bud Light Stage has got you covered. With a different musical theme for every day of the event, you won’t be disappointed with these free acts. Featuring Chicago’s best, take a look at the full Bud Light Stage lineup to see when your favorite act goes on! Looking for a more refined Taste experience? Consider attending one of the Celebrity Chef du Jour events. These sit-down, 3-course meals feature a different world-renowned chef each day in a beautifully decorated, air-conditioned tent at Buckingham Fountain. Lending a helping hand are students from the Washburne Culinary Institute. Tickets are $45 each and can only be purchased in advance. See the list of daily chefs and what yummy creations they have in store and purchase tickets here! Worried about getting lost while you wander from one delicious food stand to the next? Never fear! 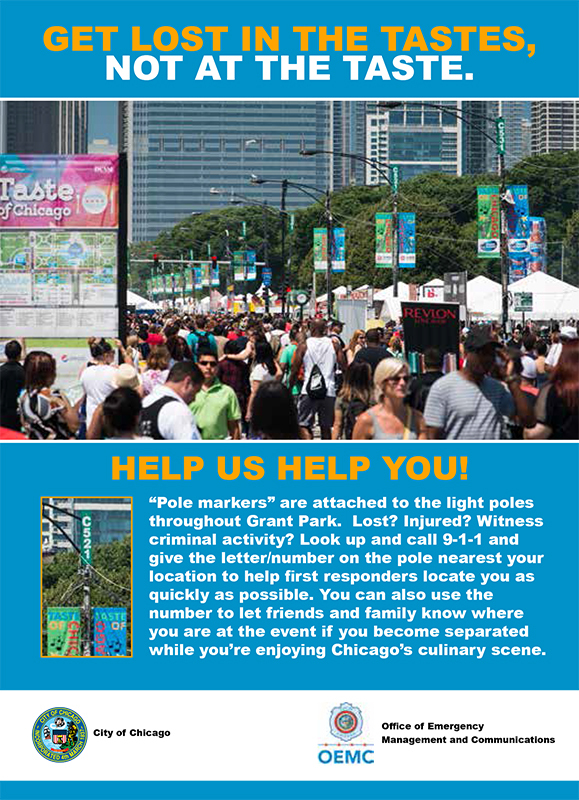 The innovative folks at The Taste have come up with a great system to help you find separated friends & family or help first responders find you faster. Find out how! A complete list of regulations, helpful hints & public transportation guides can be found here.